I am so excited, guys. You don’t even know. This whole 52 crafts in 1 year is turning out so awesome. I can see my skills getting better as the days pass! Today’s craft is probably one of the most professional-looking things I’ve ever sewn. It started with some fabric my sister-in-law bought for me in Malaysia. 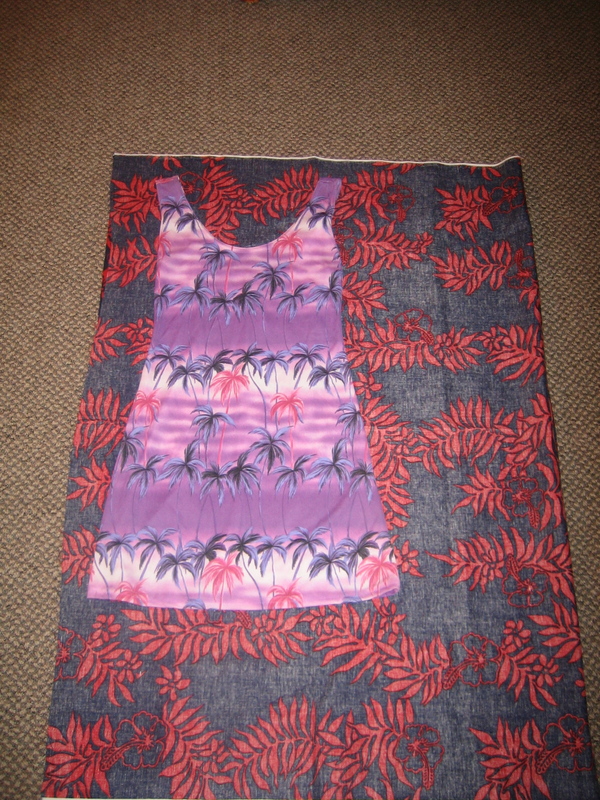 She actually bought me two different fabrics, but the one I used first was stiffer and more suited to a shift-style of dress, which is what I decided I needed in my closet. Last summer, I went to a yard sale and got 15 articles of clothing for $5. One of these things was a purple and pink, beachy shift dress that was absolutely skin tight. (Not sure what I’m making out of that yet.) While it’s not really my style as-is, it was great for drafting a pattern. 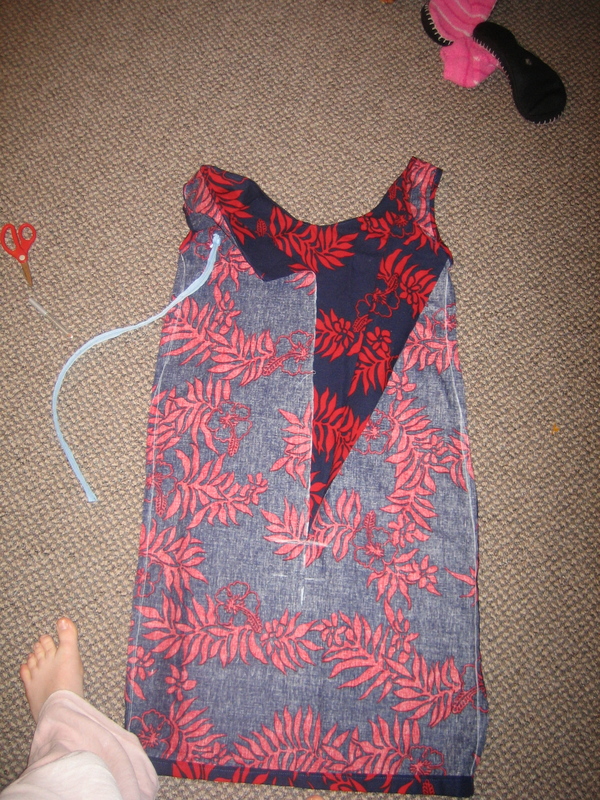 I laid it down on my fabric, wrong side up, and traced around it, giving myself a generous seam allowance since I needed the finished dress to be bigger than the dress I was tracing. As I cut it out and pinned it on Fantasia for fitting, I realized two things: One, the fabric had very little stretch to it. (I don’t know why I didn’t notice this before.) Two, Fantasia has man-shoulders which prevented me from getting the dress onto her unless I unpinned it and then re-pinned it around her. 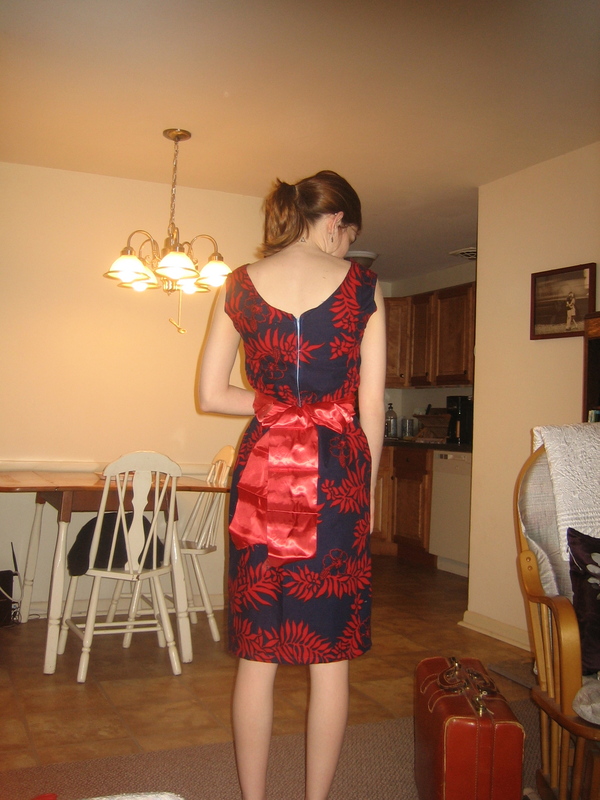 Not to be discouraged, I decided to add a zipper down the back. Disclosure: Zippers terrify me. They’re so complicated and toothy! 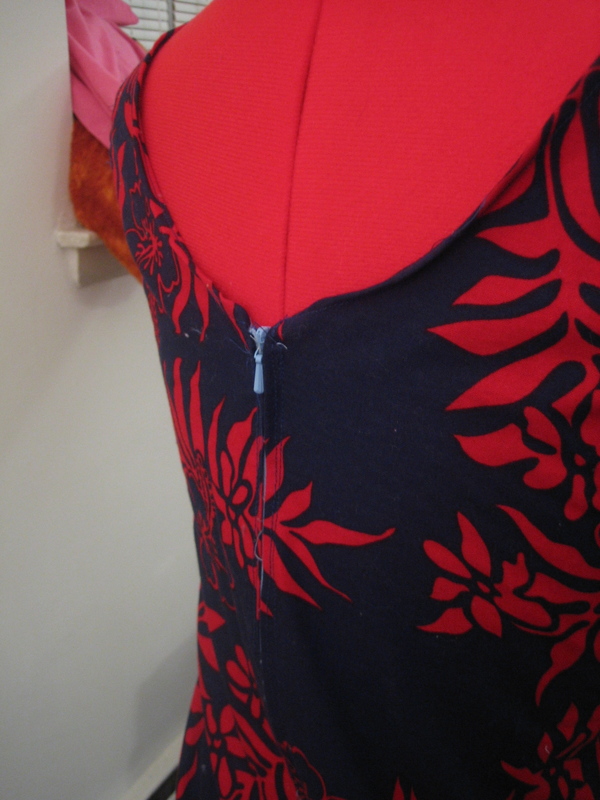 I have never, ever added a zipper to anything before. 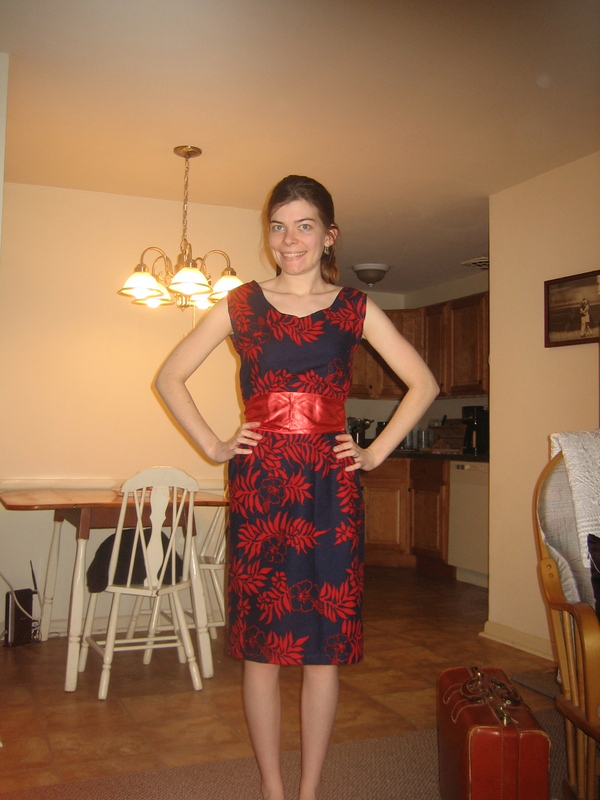 But, I had a zipper I’d salvaged from one of my mom’s old dresses (before I turned it into a snazzy skirt) so I thought: I can do this. Pep talk out of the way, I got to work. 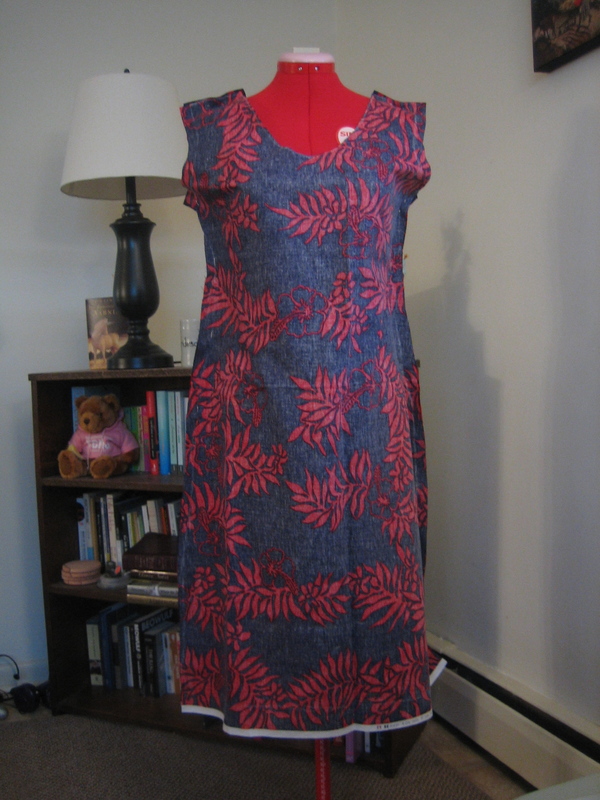 First I sewed the sides, then I hemmed the neck, arm holes, and bottom.Then I cut a slit down the back slightly shorter than the length of the zipper I planned on using. 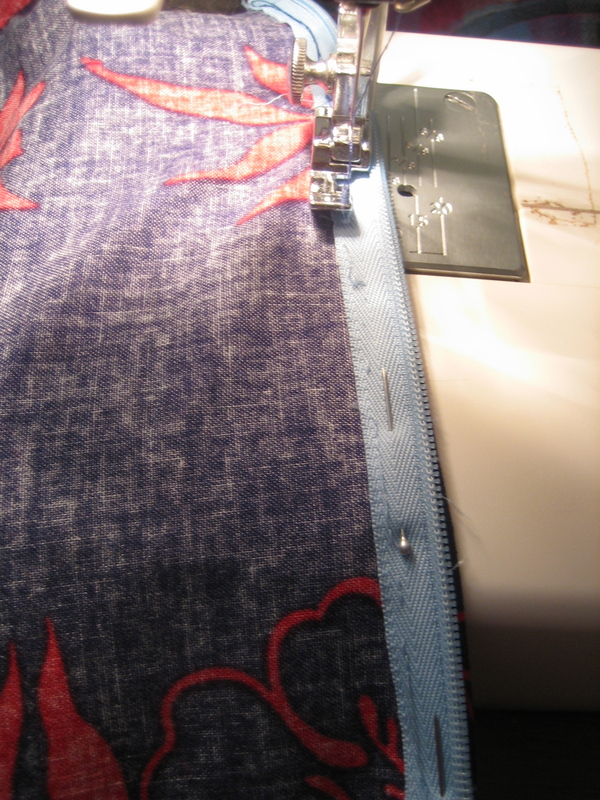 I hemmed the edge of the slit to give it a clean look when I was done. Yes, I am wearing pink velour pants. Next, I pinned the zipper in, got out my sewing machine accessories bag, put on the special “Zipper Presser Foot” and got to work. The presser foot is the thing holding the fabric down. And a close up of the zipper. Bam, friends. That’s how it’s done. Zippers can’t stop me anymore, I am queen of all things zippy. =P Thank you, Hani, for the beautiful fabric!! 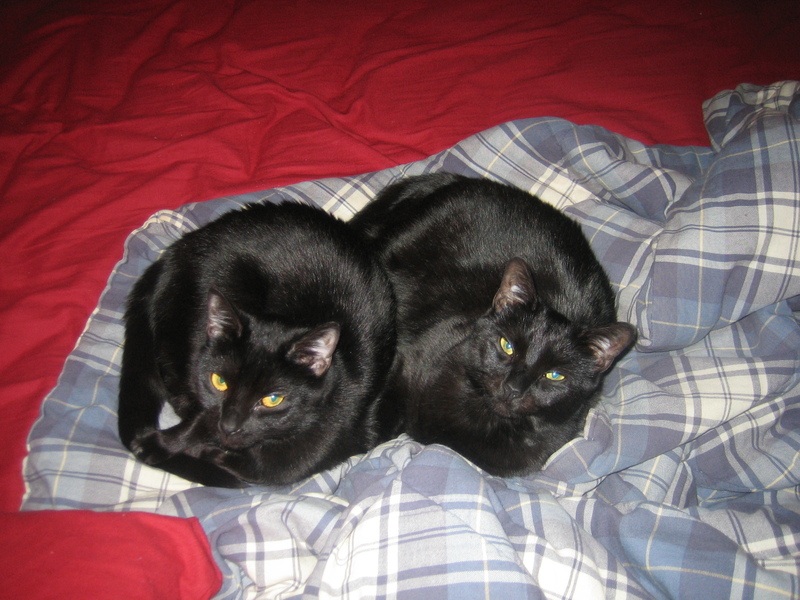 Bonus picture: The kitties like to snuggle. They lead a rough life. Beautiful dress! And a zipper! You are learning sooo much with these projects!